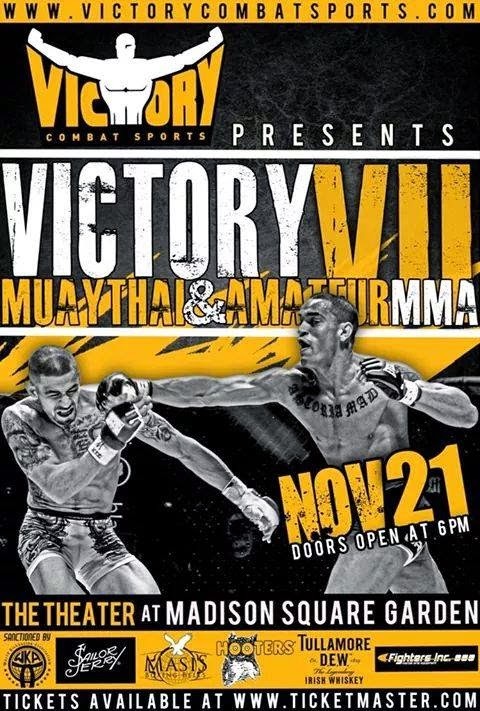 New York, NY (October 2, 2014) – Victory Combat Sports announced today that “Victory VII”, a Muay Thai and amateur Mixed Martial Arts event, will take place at The Theater at Madison Square Garden in New York City on Friday, November 21st. This historic occasion will mark the first-ever MMA event in the renowned history of Madison Square Garden. Victory Combat Sports, New York’s premiere MMA promotion, has joined forces with Take On Productions CEO Mike Gasparski and President Eddie Cuello, to produce an action-packed event. This historic evening will feature the best in Muay Thai Kickboxing talent alongside New York’s premiere amateur MMA fighters. Take On Productions was responsible for promoting Muay Thai at the Mecca I and II, which marked the first kick-boxing events at Madison Square Garden. Tickets go on sale Monday, October 6, and start at just $35. Tickets will be available at www.THEATERATMSG.com , all Ticketmaster locations, the Garden box office, and at Muay Thai and MMA gyms throughout NY, NJ, and PA. Victory VIP ticket packages will also be available via www.VictoryCombatSports.com, along with the full fight card, fighter information, and other exciting content. “Victory VII”, the biggest event ever sanctioned by the WKA in New York, will feature an explosive fight card including the best Muay Thai and MMA fighters alternating in the ring, with several titles on the line. “We are very excited to have the opportunity to work with Victory Combat Sports. We look forward to combining the level of production and Muay Thai fights that New York fans have come to expect from Take On, with the energy and excitement of Victory MMA to bring “Victory VII”. Having it be the first MMA event at the Garden just puts the icing on the cake,” stated Take On CEO Mike Gasparski. ”We’re very excited for the opportunity to make history again by bringing the first ever MMA event to MSG. We’re always very excited to give the fans another great show in a fantastic venue” remarked Victory Combat Sports CEO Kevin Lillis. Eddie Cuello, the president and matchmaker of Take On Muay Thai, has put together another spectacular fight card, mixing up high level Muay Thai bouts with the top amateur MMA in the Tri State area. “We are ready to show the New York fight fans these two great sports, in the ring on such a historic stage” said Cuello. The fight card will feature Take On Muay Thai champ Ariel Abreu in a MMA showdown against NYC’s Chike Obi, knock out artist Pawel Zawistowski taking on Muay Thai standout Manny Casais in a 3 Round Victory Title fight. Also on the card will be 2012 wrestling Olympian Ibrahim Farag, UFC Gym’s NJ Mac, and Take On Muay Thai Champ Jason Van Oijen, among many other top standouts. The best local women will also highlight “Victory VII” as 2013 Female Fighter of the Year Gianna Smith, women’s Muay Thai and MMA phenom Prairie Rugilo, and Long Island’s own Jess Cavagnaro will give the fans fireworks in the ring. All of the top Tristate gyms will be represented by fighters in the biggest MMA event to come to New York. For more info including highlights from past events, fight previews, news and the full fight card, stay tuned to VictoryCombatSports.com.